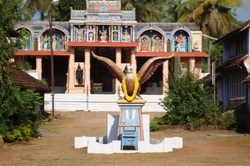 Shree Lakshmi Narayana Perumal temple is situated in the village of vadakkencherry in palakkad district of kerala, east wide south Malabar region and surrounded by 108 houses. 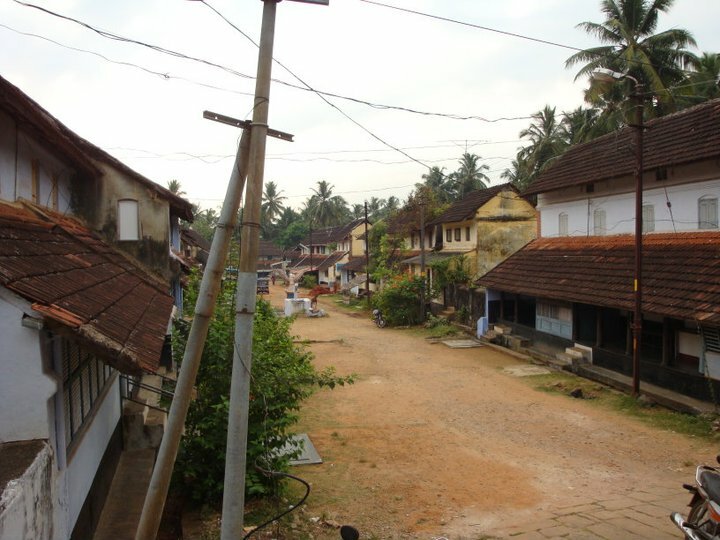 Tamil Brahmins were invited to kerala for performing religious rites and then Raja of Palakkad offered land to them to build the temple and the houses for them which is the base of the village. Presiding deity of the temple is Lord Narayana in sitting posture in a lotus keeping his consort goodness lakshmi on the left lap holding each other. The four handed lord holds lakshmi with his left hand and keeps sudharshanachakra and shank on right and the other hand is kept in abahyamudhra. In south west corner of the temple there is shine for goodness durga vishnu’s sister. In this temple first respect is given to the upa devatha (lord durga) . The gramam street is divided into two retta(two) theruvu and otta(one) theruvu in otta theruvu near appa kulam (pond) lord vinayaka first deeparadhana is performed to lord vinayaka and next durga finally lord lakshmi narayana . The temple is very ancient and belived that to have survived the attacks of Haidar ali etc. The Ekadasi day is the grandest of the festival days and is called 'Ekadasi Velakku'. The celebrations start in the morning. The Thadambu is hoisted onto a caparisoned elephant. This elephant is joined by two other caparisoned elephants on either side. Usually, the grandest of the 3 elephants is chosen to carry the Thadambu. The Nadaswaram accompanies the hoisting of the Thadambu. Once hoisted, the Panchavadhyam takes over as the Deva Vadhyam. A full company of Panchavadhyam players are used here. After playing the initial round inside the temple main hall, the procession meanders along the main village road, occasionally stopping at various points along the route and entertaining the onlookers. The Nagasahayam and the Devi (Mariamma) temple are also visited and on the return route reaches the Vinayaka temple. The Nivediam is performed at all the houses enroute just like the earlier 10 days. The Panchavadhyam finale is played at the hall in the Vinayaka temple, ending with a Kalasham. The ending of the Panchavadhyam acts as a signal to the Chenda players to start their performance. The Chenda melam is initially played in the Pandi melam style, which is an Asura Vadhyam style of playing. The procession returns to the Lakshminarayana Perumal temple. Once the procession reaches the temple main hall, the Chenda players transition the music into the Panchari Melam style. The finale is played in the main hall and the procession comes to a close with the Thadambu being brought down from the caparisoned elephant. The 12th day has a short ritual with the idol of the Lord taken for a traditional bath. The hurried procession happens on an elephant, minus any decorations, the idols being held by the temple priest on the shoulders of the elephant. All the village subjects mix turmeric with water in containers and splash the mix onto the idols which is taken to the pond in nearby Thiruvara. Once taken back to the Lakshminarayana Perumal temple a special Thadambu of the Lord is hoisted onto the shoulders of a caparisoned elephant and a procession of the village is done again. Once the procession is completed, the idol of the Lord in the Lakshminarayana Perumal temple is bathed with sandalwood paste, the process called Kalabham. Food is prepared for a feast for the village and this food is first offered to the Lord as a Nivediam, post which the feast opens up for the village members. The flag mast being brought down signifies the end of the festival and is performed before the start of the feast.